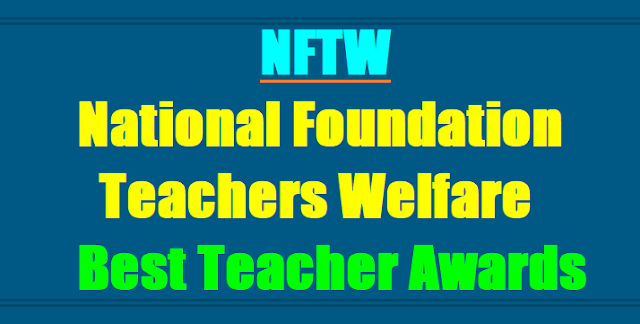 TS State Best Teacher Awards 2017-The Secretary - Treasurer, #NFTW and DSE Telangana has announced the Telangana State National Foundation for Teachers Welfare State Best Teacher Awards 2017 Notification and invites the applications from the eligible and interested teachers. Here, TeachersBadi.In Team is providing the certain guidelines for selection of National Foundation Best Teachers Welfare Award 2017. National Foundation for Teachers' Welfare, Telangana State will be Celebrated of Teachers' Day function on 5th September 2017 at Hyderabad and Honouring working and retired teachers at State Level Function. So, DSE has informed to all the DEOs in the T State as per above said subject every year 5th September is being celebrated as Teachers' Day throughout the Country. This Day has a special significance for us, as it happens to be the birthday of our revered former President of India late Dr.Sarvepalli Radhakrishnan who himself was a Teacher of International Status. Sub:-National Foundation for Teachers' Welfare - Telangana - Hyderabad - Celebration of Teachers' Day function on 5th September 201 7 at Hyderabad - Honoring working and retired teachers at State Level Function - Proposals - Called for - Regarding. Read:- This office Proceedings even. No. Dated:24-07-2017. The attention of all the District Educational Officers in the Telangana State are invited to the reference read above and they are requested to take personal attention to furnish the proposals immediately, as the sufficient time has already given to the purpose. National Foundation Teachers Welfare - School Education – Selection of Best Teacher for State / National Foundation Teachers Welfare Awards, 2017 – Orders – Issued. GOVT ORDER: In the reference 1st read above the Government has Constituted a State Level Committee for selection of Teachers for State Awards / National Foundation Teachers Welfare Awards,every year on Teacher’s Day. Name of Category and No. of awards to be given for each district. 3. Shawl and Merit Certificate. They will be paid 3 Tier A.C. Sleeper or actual bus fare subject to the production of tickets and D. A as per the A.P.T.A. Rules. a) One proposal from each category is to be considered from each district. b) In the case of working teachers, he/ she should have not less than 15 years of continuous service as on 5th September of the year. e) The Members of the Inspectorate, Staff of College of Education and Training Institution are not eligible for the Award. f) The proposals of working / retired teachers should to recommended by the District Selection Committee headed by the District Collector concerned. For selecting the candidates from the working/retired teachers of Primary/Upper Primary Schools for the Award of National Foundation for Teachers' Welfare, Andhra Pradesh, at the Mandal Level, the following committee is constituted. (ii) Criteria for selection working/retired teachers for this Award to the District Educational Officer, before positively. NOTE:- The quorum of Committee shall be 2 Members. The Deputy Educational Officer shall list out the eminent working,/retired teachers of High Schools in his jurisdiction and place the particulars of eminent working/retired teacher: before the selection committee at Divisional Level and the Committee shall select the meritorious working/retired teachers from among them as detailed below, The Deputy Educational Officer shall send the particulars of selected working/retired teachers in the prescribed proforma along with (1) the Certificate of Antecedents & Character and (ii) Criteria for selecting the working/retired teachers for this Award to the District Educational officer before: positively. For selecting the candidates from the working/retired teachers for the Award of National Foundation for Teachers' Welfare, Andhra Pradesh, at the District Level, the following committee is constituted. to the SECRETARY-TREASURER,. NATIONAL FOUNDATION FOR TEACHERS' WELFARE & COMMISSIONER OF SCHOOL EDUCATION, TELANGANA STATE, HYDERABAD- 500 004 ON OR BEFORE as per the announced schedule for finalizing the candidates for the Awards of National Foundation for Teachers' Welfare before the state Level Committee. The District Educational Officer shall give wide publicity of the programme through News papers or any other local mass media. The proforma of the recommendations shall be communicated by the District Educational Officer to the Inspecting Officers under their jurisdiction.